Can You Lose 10 Pounds in 2 Weeks Naturally? Restricting calories and getting aerobic exercise may result in a loss of 10 pounds over two weeks, but it's not a realistic goal for everyone -- it's downright impossible for some. Calories must be severely reduced, which may not be feasible, and isn't a "natural" way to lose weight. You'll also need a regular regimen of aerobic exercise to increase the odds of success. Because losing 10 pounds in only 14 days requires an extreme diet and could have negative health effects, it's better to revise your goals and take longer to shed the weight. Before attempting any weight loss diet, talk with your physician first to be sure it's safe for your health. In the first week of a strict diet, you'll lose water weight from two sources -- water retained throughout your body and water associated with carbs stored in muscles. The amount of weight lost from retained water varies from one person to the next. If your diet normally includes a lot of salt, you'll probably lose more water than someone who normally follows a low-sodium diet. Muscles store carbohydrates in the form of glycogen, and every molecule of glycogen is bound to water. As you use glycogen for energy, this water is released, and you'll lose 3 to 5 pounds of water weight. Just remember that water associated with glycogen is essential for muscles, so you will eventually regain those pounds. By comparison, water retained because of a high-salt diet or other medical condition isn't necessary or healthy. As you return to a normal diet, you can minimize water retention by avoiding high-sodium foods, including canned products, salted snacks, smoked or processed meats, and some seasonings such as soy sauce. If you lose 5 pounds of water weight, you're left with 5 more pounds to lose by cutting calories. But keep in mind that everyone doesn't lose the same amount of water, and people who only carry 10 or 15 extra pounds of fat will have a harder time losing weight quickly. Since it takes 3,500 calories to equal 1 pound, you'll need to shave 1,250 calories from your daily diet to lose 5 pounds in two weeks. Whether you can go that low in calories depends on the amount consumed before starting the diet. Men and women who need to consume 2,450 calories or more to maintain their current weight can safely eliminate 1,250 calories because they'll still get the 1,200 calories needed to sustain basic metabolism. Be aware if you end up with 1,000 calories or less after you subtract 1,250 calories from your present intake. A low-calorie diet -- 1,200 calories per day for women and 1,600 daily for men -- is safe for most people for a limited time, reports the National Institute of Diabetes and Digestive and Kidney Diseases. But don't forget that if you drop calories below those lower limits, your metabolic rate slows down, and it's harder to lose weight. A diet of 800 calories or fewer must be supervised by a doctor because of the risks of nutrient deficiencies and other side effects. People following this type of very low-calorie diet usually use meal replacements rather than regular food, which isn't a natural diet. It goes without saying that if you don't lose any water weight, you'd have to depend on calorie restriction to drop an entire 10 pounds in two weeks time. That translates into reducing the daily diet by 2,500 calories -- an amount that's impossible for most people to safely eliminate. An exercise plan to strengthen and build muscles is important when you're trying to lose weight, because it helps prevent muscle loss. But when the goal is to drop pounds in a short amount of time, you also need some aerobic exercise, because it burns more calories and facilitates more weight loss than strength training. If you can commit to an hour of aerobic exercise daily, you may be able to add the calories burned back into the daily diet, which helps keep you out of the dangerously low calorie range. However, keep in mind that when you're drastically cutting calories, your energy levels may be low, which makes it tough to exercise. When you have a more sensible goal of 1 to 2 pounds lost per week, you can eat more calories and support both aerobic exercise and strength training for maintaining and building your lean muscle mass. The number of calories burned during aerobics depend on your weight and how long you exercise. Thirty minutes of swimming, rowing, running, cycling, high-impact aerobics and jumping rope burns 210 to 300 calories in a 125-pound person, reports the Harvard Medical School. For someone weighing 185 pounds, a half-hour of the same activities uses 311 to 444 calories. Creating a well-balanced meal plan puts you on a path that's easier to follow beyond the initial two-week diet. If you have any questions about creating a healthy low-calorie menu, consult a registered dietitian. Otherwise, fill 1/2 of your plate with veggies and fruits, 1/4 with protein and the remaining 1/4 with whole grains. Keep your energy up with complex carbs such as beans and whole grains. Eat lots of vegetables, and for lean protein, enjoy fish, skinless poultry, lean beef, eggs, soy products and quinoa. You could also consider following a very low-carbohydrate diet, which limits carbohydrate intake to less than 50 grams daily, noted a review in the European Journal of Clinical Nutrition in August 2013. Low-carb diets are effective for weight loss, because they increase the amount of fat burned for energy, but researchers disagree about whether they're more effective than severely restricting calories. The downside to following a low-carb diet is that the first few days are sometimes marked by headache and fatigue, which you may not want to tolerate for a short-term diet. Pregnant women, people with kidney disease and anyone with osteoporosis should check with their doctor before starting a very low-carb diet. Trying to lose 10 pounds in two weeks is not healthy, and you'll probably gain back most, if not all, of the weight. Such drastic calorie reduction -- and the lack of adequate carbs and protein -- damages muscles and organs as they break down so the body can produce glucose for your brain. You'll have better weight loss success if you eat a minimum of 1,200 to 1,600 calories daily, include adequate carbs and proteins in your diet, and stretch your diet out over five weeks so you can lose at the more sustainable rate of 2 pounds a week. 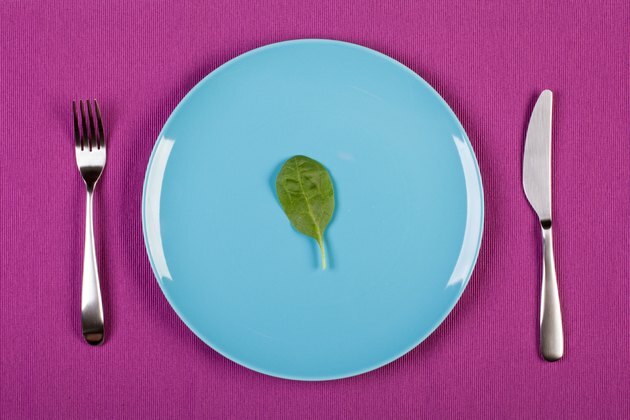 Do Low-Calorie Diets Slow Down Metabolism? How Much Weight Will I Lose if I Only Eat Fruits and Vegetables for Two Days?